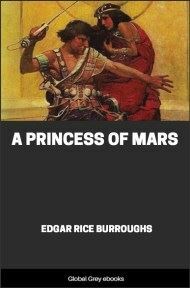 This is the seventh book in the Barsoom Series. 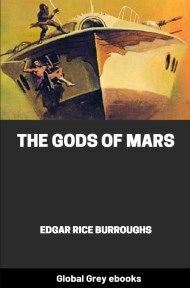 The story is purportedly relayed back to earth via the Gridley Wave, a sort of super radio frequency previously introduced in Tanar of Pellucidar, the third of Burrough's Pellucidar novels, which thus provides a link between the two series. The story-teller is Ulysses Paxton, protagonist of the previous novel, The Master Mind of Mars, but this story is not about him; rather, it is the tale of Tan Hadron of Hastor, a lowly, poor padwar (a low-ranking officer) who is in love with the beautiful, haughty Sanoma Tora, daughter of Tor Hatan, a minor but rich noble. As he is only a padwar, Sanoma spurns him. Then Sanoma Tora is kidnapped, and the novel moves into high gear. 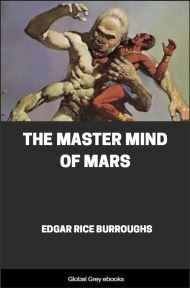 As Tan Hadron crosses Mars ("Barsoom", as Burroughs calls it) searching for Sanoma Tora, he encounters some of Barsoom's most ferocious beasts: huge, many-armed, flesh-eating white apes, gigantic spiders, and the insane cannibals of U-Gor. He also meets the mad scientist Phor Tak. I am Tan Hadron of Hastor, my father is Had Urtur, Odwar of the 1st Umak of the Troops of Hastor. 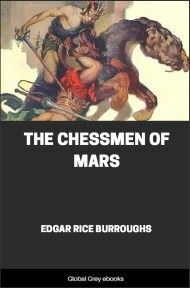 He commands the largest ship of war that Hastor has ever contributed to the navy of Helium, accommodating as it does the entire ten thousand men of the 1st Umak, together with five hundred lesser fighting ships and all the paraphernalia of war. My mother is a princess of Gathol. As a family we are not rich except in honor, and, valuing this above all mundane possessions, I chose the profession of my father rather than a more profitable career. 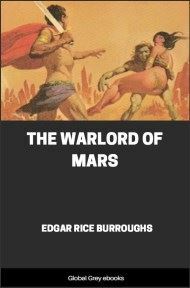 The better to further my ambition I came to the capital of the empire of Helium and took service in the troops of Tardos Mors, Jeddak of Helium, that I might be nearer the great John Carter, Warlord of Mars. My life in Helium and my career in the army were similar to those of hundreds of other young men. I passed through my training days without notable accomplishment, neither heading nor trailing my fellows, and in due course I was made a Padwar in the 91st Umak, being assigned to the 5th Utan of the 11th Dar. What with being of noble lineage by my father and inheriting royal blood from my mother, the palaces of the twin cities of Helium were always open to me and I entered much into the gay life of the capital. It was thus that I met Sanoma Tora, daughter of Tor Hatan, Odwar of the 91st Umak. Tor Hatan is only of the lower nobility, but he is fabulously rich from the loot of many cities well invested in farm land and mines, and because here in the capital of Helium riches count for more than they do in Hastor, Tor Hatan is a powerful man, whose influence reaches even to the throne of the Jeddak. Never shall I forget the occasion upon which I first laid eyes upon Sanoma Tora. It was upon the occasion of a great feast at the marble palace of The Warlord. 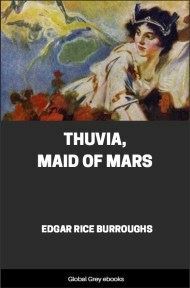 There were gathered under one roof the most beautiful women of Barsoom, where, notwithstanding the gorgeous and radiant beauty of Dejah Thoris, Tara of Helium and Thuvid of Ptarth, the pulchritude of Sanoma Tora was such as to arrest attention. I shall not say that it was greater than that of those acknowledged queens of Barsoomian loveliness, for I know that my adoration of Sanoma Tora might easily influence my judgment, but there were others there who remarked her gorgeous beauty which differs from that of Dejah Thoris as the chaste beauty of a polar landscape differs from the beauty of the tropics, as the beauty of a white palace in the moonlight differs from the beauty of its garden at midday. When at my solicitation I was presented to her, she glanced first at the insignia upon my armor, and noting therefrom that I was but a Padwar, she vouchsafed me but a condescending word and turned her attention again to the Dwar with whom she had been conversing. I must admit that I was piqued and yet it was, indeed, the contumelious treatment she accorded me that fixed my determination to win her, for the goal most difficult of attainment has always seemed to me the most desirable. And so it was that I fell in love with Sanoma Tora, the daughter of the commander of the Umak to which I was attached. For a long time I found it difficult to further my suit in the slightest degree; in fact I did not even see Sanoma Tora for several months after our first meeting, since when she found that I was poor as well as low in rank I found it impossible to gain an invitation to her home and it chanced that I did not meet her elsewhere for a long time, but the more inaccessible she became the more I loved her until every waking moment of my time that was not actually occupied by the performance of my military duties was devoted to the devising of new and ever increasingly rash plans to possess her. 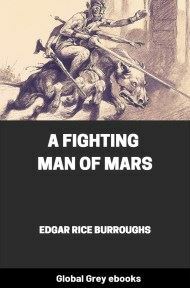 I even had the madness to consider abducting her, and I believe that I should eventually have gone this far had there been no other way in which I could see her, but about this time a fellow officer of the 91st, in fact the Dwar of the Utan to which I was attached, took pity on me and obtained for me an invitation to a feast in the palace of Tor Hatan. My host, who was also my commanding officer, had never noticed me before this evening and I was surprised to note the warmth and cordiality of his greetings. "We must see more of you here, Hadron of Hastor," he had said. "I have been watching you and I prophesy that you will go far in the military service of the Jeddak." Now I knew he was lying when he said that he had been watching me, for Tor Hatan was notoriously lax in his duties as a commanding officer, all of which were performed by the senior Teedwar of the Umak. While I could not fathom the cause of this sudden interest in me, it was nevertheless very pleasing since through it I might in some degree further my pursuit of the heart and hand of Sanoma Tora.